Was your last meeting successful? Were you an effective chairman or an active participant? Were those who had a contribution to make invited? Did the meeting accomplish the stated purpose? These questions and many more need to be asked and answered affirmatively if organizational meetings are to be successful. The chairman - the one who plans, hosts, and leads a meeting - must establish a proper environment. The environment, and the feeling conveyed to the participants by the chairman, will have a great impact on the outcome of the meeting. The chairman must stimulate, guide, clarify, control, summarize, and evaluate the discussion, keeping in mind his responsibility to accomplish the meeting objectives. If he fails to perform his role effectively, the meeting may turn into meaningless discussions of irrelevant subjects, a series of pointless power plays, and even boring monologues. Motivate and commit participants to courses of action. The fundamental decision concerning meetings is not whether to hold them, but how to make them effective. Recent studies show that members of middle management spend 30 percent of their time in meetings. Unproductive meetings can result in substantial loss to an organization. On the other hand, a productive meeting becomes a tool for effective management communication, and serves as a vehicle for development of specific plans or the organization of specific tasks. In any case, successful meetings don't just happen; they occur as a result of careful planning, good leadership, and close attention to details before, during, and after the session. Let's review each of these steps in detail. To solve a current problem within a group. The meeting plan should not be too broad or the meeting may be doomed from the beginning. Therefore, a wise chairman identifies realistic objectives for the meeting and is prepared to meet them. Is an agenda necessary? How long will it require to carry out the agenda? Would the meeting run smoothly and be just as successful without it? The agenda should crystallize the intended meeting objective(s) and establish the time available to accomplish them. Whether the agenda is in writing or stated verbally by the chairman, it provides the framework to keep the meeting on target. Furthermore, it permits the chairman to devote his attention to managing the interplay of the participants. Focus the agenda on items relating to the same general topic, if possible. Begin with a discussion of topics of major concern to participants; then, if necessary, discuss related topics of lesser importance. A meeting of this type requires fewer attendees and generates better participation in the discussion. Schedule fewer agenda items when the topics cannot be related. It is difficult for most participants to come to a meeting completely prepared on a wide variety of topics. The more concise the agenda, the better. Attach background data for each topic to be discussed, when the agenda is distributed. This will ensure that each participant has some familiarity with the items before arriving at the meeting. Establish a time limit and priority for each agenda item. Consider whether the topic to be discussed is familiar, new, controversial, or complex. Don't have the meeting run too long. One hour is usually the norm for busy middle- to upper-level managers. When the meeting is scheduled on a quarterly, semiannual, or annual basis, it may run longer to accomplish the objectives. Schedule a "break" when the meeting is expected to take over 2 hours. Submit the agenda to the participants, with the background data, as early as possible. This will give each participant more time to prepare for the meeting. The chairman should be sure the meeting is needed. If the need disappears, he should cancel the meeting. The convenience of the place. The size of the room. It should not be too large or too small. If the right-size room is not available, it is better to select a small room, rather than too large a room. A small room presents a friendlier atmosphere than a large, sparsely filled one. The seating arrangement and the availability of extra seats if needed. The lighting, heating, and ventilation. Any visual aids required and their proper use. Availability of extra paper and pencils. The need for name plates or name tags. It is the chairman's responsibility to begin and end the meeting on time. It is the responsibility of attendees to arrive on time. Two techniques proved effective in curing cases of chronic tardiness are (1) to ignore latecomers; and (2) to make no attempt to bring late-comers up to date. How many persons should be invited to the meeting? What is the purpose of inviting each person? The attendees should be viewed as management resources - each able to contribute to the meeting through knowledge or experience or both. It is wise to include some of the persons in the organization to whom action items may be given after the meeting. This tends to encourage better support for the topics to be discussed. Attendance by disinterested persons tends to increase non-relevant discussion and impede the meeting. Thus, the chairman should invite as many people as necessary, but no more. The size of the meeting tends to affect the way it functions. For example, if attendance exceeds seven, there is a tendency for communication to become more centralized, and participants have less opportunity to communicate directly with one another. As the number of people invited increases, the ability of the chairman to predict the interaction that will take place becomes more difficult. It is important to have all relevant points of view on a particular subject under consideration represented at the meeting, even if this makes it a large meeting. A large meeting requires increased formality and extra time for each topic to ensure adequate communication between participants. Proponents of the "small group" theory consider seven to be the maximum number of participants for a productive meeting. However, if a problem-solving type of meeting is to be held, some authorities claim that up to 12 participants can be accommodated effectively. If the number of participants exceeds 18, the chairman may find it almost impossible to accomplish the meeting objectives. On the other hand, in a meeting involving only three participants, there may be a tendency for two of them to form a combination against the third participant. This could be disastrous so managers should guard against organizing too small a meeting. Why should the chairman be concerned about protocol? How can this affect the success of a meeting? 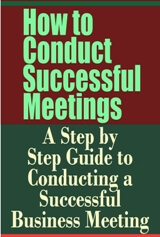 One of the initial steps to ensure a successful meeting is to give adequate consideration to protocol. Protocol might be defined as the application of common-sense courtesy. Notify participants well in advance of the meeting date, and provide them with an agenda and background data. Notify department heads when subordinates with expertise are needed. Make sure that arrangements with resource persons outside the organization are completed before the meeting. Introduce resource persons and newcomers at the start of the meeting. Also, make their affiliations and expertise known to the other attendees. List participants in alphabetical order in the meeting announcement and minutes, unless someone present far outranks the others. In that case, list this person first. Express gratitude to those from outside the group as well as to those within the group for significant contributions to the success of the meeting. Advise those invited to attend the meeting of postponement or cancellation as far in advance as possible.